Swollen gums are a common oral health complaint and are experienced by most adults at some stage. Most people don’t give them much thought, apart from noticing the discomfort, but they it may be an indication of a serious dental health problem. Before learning how to treat swollen gums it is important to know the root cause. One of the main causes of swollen gums is gingivitis. Gingivitis is a swelling of the gingiva (gums) and is an dental condition that is caused by an infection in the gum tissue. Gingivitis can be quite mild, but it can also become acute and lead to serious dental problems. Nasty taste in your mouth even after brushing your teeth or using something to freshen the breath. When gingivitis becomes more advanced, sufferers are likely to begin to notice serious and even painful symptoms. Advanced gingivitis is called periodontitis or periodontal disease. By the time your condition has become periodontitis, you are at increased risk of serious and long-lasting or permanent oral health problems. Teeth moving from their usual alignment. 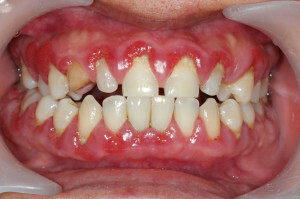 Gingivitis is chiefly caused by bacterial build-up. Your mouth provides the perfect environment for bacteria to develop. It is warm and moist and has a continual supply of nutrients for the bacteria to feast upon in the form of food residue. Daily the mouth is bombarded by bacteria that develop and feed on the leftover bits of food in your mouth. The bacteria also react with your saliva and produce plaque, which is a sticky matter that clings to your teeth and can cause infection. When plaque hardens, it becomes tartar, a calcified matter that can exacerbate infection. It is best removed by your oral care professional. The only way to protect your teeth and gums from gingivitis is by reducing the bacteria and preventing plaque build-up. The most effective way to do this is to follow a good oral health routine at home. This daily routine should include brushing, flossing and using a mouthwash at least each day, but ideally after every meal. However , beware of commercial mouthwashes (more to come). Following a good oral health routine is the most effective way of protecting your teeth and gums from gingivitis, other forms of gum disease, cavities, abscesses and other dental problems. By brushing, flossing and rinsing daily, you ought to be able to keep the bacterial onslaught under control. As well as your home dental routine, you should also schedule twice-yearly dentist check-ups. Your dentist is able to remove any stubborn plaque or tartar and leave your mouth completely clean and able to combat bacteria. They are also able to spot the early warning signs of gingivitis, often before you notice any concrete symptoms yourself. The manner in which you brush will maximize the removal of bacteria with each brushing. You should be brushing for two minutes each time – most people do not brush for anywhere near this length of time. Set a timer in order to get an accurate feel for how long this should take. Next, you need to ensure that you are using a soft-bristled brush. Use the brush to stroke away from the gum and hold the brush at a 45-degree angle. Start by brushing the outsides of the upper teeth, then the outsides of the lower teeth. Then you brush the insides of the upper teeth and the insides of the lower teeth. Next, the top surfaces of the upper and then lower teeth. Finally, brush your tongue because a lot of bacteria settle there throughout the day. When flossing, begin at the back of the upper teeth and slowly slide the floss between into the gum line between the teeth. Shift up and down along the tooth tooth itself in order to remove the food particles and plaque that accumulate there. Repeat, moving forwards and then start with the lower teeth. There is now quite a lot of controversy surrounding some of the commonly used ingredients in commercially available dental products. Ingredients such as fluoride and sodium lauryl sulphate have been found by some scientific studies to potentially cause health problems or be toxic. Fortunately, there are also many natural products that contain 100 percent botanical oils. These have been shown to be both safe and effective for dental use. 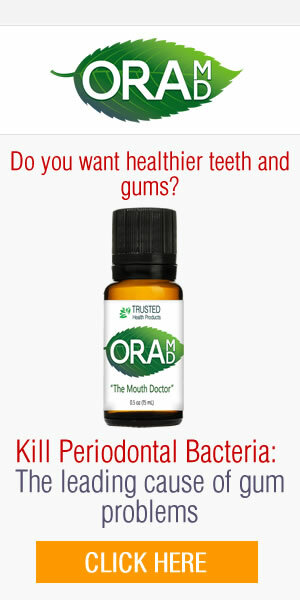 Many of these natural oils can kill bacteria and keep it under control, leaving you without stinky breath. You are left feeling clean and fresh and without damaging sensitive soft tissue inside your mouth. Sodium lauryl sulphate (SLS) – SLS is a foaming substance found in virtually all toothpastes. It can irritate soft tissue including the gums and lead to allergic reactions. Some studies have also demonstrated that it can cause neurotoxicity and may also be a carcinogenic agent. Triclosan – this is an antibacterial commonly used in mouthwash, but it is also classed as a pesticide and is a known carcinogen. Fluoride – this ingredient is potentially toxic. Although it has been used in the past to strengthen teeth, more recent studies have shown that it may not be as effective as first thought at protecting teeth from cavities. It is easy to protect your teeth from swollen gums and other symptoms of gingivitis by following a regular daily dental routine that makes use of the right products and techniques. By visiting your dentist for regular check-ups as well, you can usually avoid developing gum disease and enjoy good oral health in the long term. Discover how to treat swollen gums and its cause.